While living a life with OCD, I found myself time and again held up, detoured, postponed, delayed and sometimes even stopped in my tracks…because of OCD. I was in a snag, a knot. I would be feeling happy…and then OCD enters in. I was embarrassed, panicked and saddened time and again. I was in a knot. 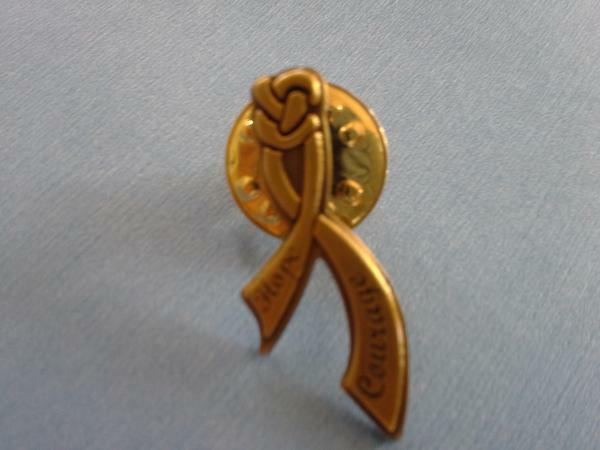 Hence, the top of this ribbon is shaped as a knot. With therapy, webinars, books, IOCDF conferences, and lessons we learn from each other…we have Hope. Also, deep inside each of us is Courage. OCD has been leading us astray and blocking our courage. But it is there…listen, search, dig deep…you have the courage. Our lives can become less knotted and smoother (like the ribbons) with effort, Hope and Courage.